If you are applying for a position that is research focused this section will be the most important one on your CV and should therefore follow immediately after the personal information, employment history, and education and training sections. If you are applying to a position where teaching will be the focus, move the research section further down in your CV. The first thing to list in your scholarship and research section is peer-reviewed (refereed) journal articles. These publications are how research productivity and impact are measured. You might have several categories for these articles including published papers (e.g. articles that have been published online or in print by the journal), papers accepted and in press (e.g. articles accepted by the journal that are in production for publication), and papers under review (e.g. articles that you have submitted to a journal that are under consideration for publication). I sometimes see a category called “manuscripts in preparation” on CVs and I personally don’t like this category. When I see this on a CV I have no way of knowing what stage the publication is at and therefore cannot fully evaluate it. You may be submitting it next week or it might be an idea for a project that you haven’t even started yet: I have no way of knowing that. I often think that this is a way for people to pad their CV and it’s a warning sign for me. If you are going to include items in this category then list the authors, the title, the journal you intend to submit to, and the date of anticipated submission. Those details will make me more likely to believe that you have an actual manuscript in preparation. Pick a citation format for listing your publications that is commonly used in your field of research and use it consistently throughout your CV. When you are starting out in your research career you may have contributed to a book. For example, I have been invited several times to author book chapters on various topics. I list these in a category called “Invited Book Chapters” and provide the details. It is important to note whether the book has been published, is in press, or to provide a date that the chapter was accepted for publication. In book citations you must remember that the format is different than journal articles and that the names of editors are included. If your research has practical applications you may have contributed to other forms of publications such as policy development, handbooks, guides, etc. Make sure that you capture these publications in an “Other publications” section. You may also want to include an “Intellectual Property” section in order to include any patents that you may hold. In my next post I’ll address how to list research funding. After listing your personal information, the next sections of a CV are the employment history and education and training sections. When I was a student and a post-doc I didn’t have professional employment other than being a teaching assistant so I only had an education and training section on my CV at that time. Since being hired as a tenure-track faculty member I now include an employment history section on my CV. The order and content of these sections will depend on your professional experience. On my CV I’ve listed my employment history first. This will include any academic appointments that you have held (e.g. Assistant Professor, Lecturer, Course Instructor, etc.) and should include any adjunct appointments that you hold (e.g. I’m an adjunct member of the graduate faculty at a nearby institution). In addition to the position title you will also want to list the date that you started each position and when the employment ended. If you still hold the position just list the date that you started with a dash (e.g. 2010-) or list the start date and indicate that you still hold the position (e.g. 2010-present). In the education and training section you want to list your academic pedigree. List your most recent training first. On my CV I first list my two post-doc appointments, then my Ph.D., then my M.Sc., and finally my B.Sc. degree. Once you have entered graduate school I would suggest dropping your high school achievements off of your CV. For each training or educational opportunity that you put on your CV you should list the dates of the training (e.g. 2008-2010), the title of the training period or degree (e.g. Ph.D. in Molecular Biology), the department (e.g. Biology), the institution (e.g. University of Toronto), the city (e.g. Toronto), the province (e.g. Ontario), and the country (e.g. Canada). Listing the country where the degree or training took place is especially important if you are submitting your CV for an international position. Next you should list the name of your research supervisor and the title of your research project or thesis. Including this information up front on your CV allows the job search committee to get a quick idea of your career stage and academic and employment history. In my next post I’ll talk about the scholarship and research section. The first section that will appear in your academic CV will be the Personal Information section. The goal of this section is to make it easy for the interviewers to contact you. My CV only lists 2 pieces of information in this section: address and citizenship. The address that you list here will be your professional address assuming that you have an affiliation with an institution of some kind (e.g. university, hospital, or research institute). You should list the department, the institution, building, room, city, postal code, and country. If a colleague was going to mail or ship you some samples, where would you have them sent? This is the address to use. If you are between jobs then list your permanent address here. Below your address you need to indicate how employers can contact you by phone or email. Think carefully about what phone number(s) to include. Many scientists have a cell phone and use that as their contact number. If you are going to list your cell phone number as a contact number be sure that: a) your voice mail message is professional and b) that you answer your cell phone in a professional manner. Other options for phone numbers include a home land line (if you still have one) or a laboratory phone number (if your lab mates can be counted on to be professional when answering the phone and reliably pass along messages). In terms of your email address, use an institutional email address or one from a free provider such as Google (e.g. gmail). Be sure that your email address is professional; hotsexymama123@gmail.com will probably not send the message that you want to convey. I now include my citizenship on my CV as many academic job ads and grant applications in Canada state that being a Canadian citizen or a permanent resident is preferred. Including this information on my CV directly addresses this question. 1) Marital status and/or number of children. This information has no business being on a professional academic CV. 2) Age. This is no one’s business and is not relevant for the position that you are applying for. 3) A photo of yourself. Academic CVs for Canadian jobs that contain the above pieces of information act as a red flag. It tells me that the candidate is not familiar with the professional norms in Canada and has not taken the trouble to adjust their job application accordingly. In my next blog post I’ll talk about the employment history and education and training sections of an academic CV. A major difference in the applications for jobs in academia and those outside of it is the document that you use to describe your experiences, training, and skills. When applying for academic jobs you use a curriculum vitae or CV to tell the story of your professional life. When I was putting together the first draft of my CV in grad school I asked several of my mentors if they would be willing to share their CV with me so that I could see what one looked like. This is a really great way to see examples of professional CVs of scientists and it will also help you to craft an effective document for your own job search. Academic CVs contain many sections and the number and type of sections can vary depending on your scientific discipline. The order in which you present these sections will also vary depending on the type of position that you are applying to. 1) Start putting this document together in graduate school. The longer you leave it, the harder it will be to put together. 2) Get as many examples of CVs in your field as you can. This will give you an idea of what is typical in your scientific discipline. It will also give you a sense of what works in terms of content and format and what does not. 3) Create a master copy CV. A master copy CV is where you put absolutely every relevant piece of information with regards to your professional life. When you apply to a particular job you will create a tailored CV that contains a subset of information in the master CV that is relevant to the position. 4) Keep the master copy CV updated regularly. I have a standing appointment in my calendar once a month in order to input new information into my master CV so that it remains current. When a job or opportunity presents itself, you don’t want to be scrambling at the last minute to update this document. In the next post I’ll talk about some typical sections that you’ll find in a CV in the biological sciences. In the usual ebb and flow of the academic job market postings are advertised in the fall with application deadlines in December or January. In this post I offer some advice on how to identify and evaluate academic job postings for research and teaching tenure-track positions. 1) The first trick is to find academic job postings. When I was on the market for a job I had already spent some time identifying where jobs in my field of science were often posted. Two great resources for academic job listings in Canada are the CAUT (Canadian Association of University Teachers’) Bulletin (http://www.caut.ca/) and University Affairs (http://www.universityaffairs.ca/default.aspx). In addition I had a list of specific universities where I wanted to work and frequently checked their Human Resources page for career opportunities for Faculty positions. 2) The second important tip is to spend some time thinking about what you want in a career and how that fits with your personal and professional goals. Spending the time to really figure out what you want (and sometimes equally important what you don’t want) is time well spent. There is no point in applying to job ads if the “fit” between you and the position is poor. a) What position is the ad for? Is it tenure-track? A limited-term appointment? A short-term contract? It is being advertised for someone at the beginning, middle, or near the end of their career? b) Is the academic area of the position a comfortable fit for you? A bit of a stretch? A massive stretch? Can you really do the job? Do you have the research, teaching, and/or service experience to be successful in the position? c) Where is the job? What country, province, and city is the job in? What kind of institution is offering the job (e.g. university, private institute, etc.)? What do you know about the institution and its culture? What department is the posting in? Can you live and work in this geographical location and be happy? All of the above points are usually revealed in the first one to two sentences of the job posting. That’s a lot to think about before you dive further into the job ad! a) What set of knowledge and skills are they looking for (e.g. Plant Physiologist, Particle Physicist, Urban Geographer)? Can you make a solid argument that you fit this description? b) What do they tell you about the duties of the job? Is it a teaching position, a research position, or a bit of both? Does the type of position match with your career goals? c) Will you be interacting with undergraduates and/or graduate students? Do they list any specific courses that they are looking to cover? d) Do you need to set-up and fund an active research program? These things can be determined by reading the body of the job ad. You want to go over this section of the ad with a fine tooth comb in order to ensure that you have a very clear understanding of what they are looking for. 5) Still interested? Now you need to figure out how to apply to this job. a) When is the application deadline? Do you have the time to put together an excellent and solid application package and meet this deadline? b) Who is receiving the package? Is it the search committee chair, the departmental chair, an administrative assistant? c) What has to be included in the package? The usual components are a curriculum vitae (CV), research plan or proposal, and a teaching statement or portfolio. Sometimes ads will request 3 reference letters up front, but recently many committees are only asking for these if you make the short list of candidates for the position. Are there any other pieces requested in the application (e.g. professional portfolio, etc.)? d) How do you send the materials? Email? Snail-mail? Your in-depth analysis has indicated that this is a job you are interested in that may be a good fit for your future career aspirations. The next step is to get busy and start putting your application package together. The step of networking that many scientists overlook is ensuring that you actively maintain the relationships that you have worked so hard to start. When you get home from a conference within a few days you should actively take steps to stay in touch with the contacts that you’ve made. This is as easy as sending a quick and professional email. It can be as simple as stating that you enjoyed meeting that person, that you found your conversations useful, or thanking them for sharing a technique. If you offered to send someone reagents, a journal article, or data you should do so promptly when you return home. For more formal interactions (e.g. job interviews, invitations to give plenary talks, etc.) I think that the old-school idea of sending a hand-written thank-you note is appropriate and appreciated. Once you return from a conference you should also go over any notes that you took during talks, discussions, and poster presentations. These insights might influence your own research directions, or perhaps you have a follow-up question that you need to contact someone about. Pass along any useful information that you picked up at the conference to others in your research group or offer to summarize the major ideas presented at the conference to your lab group or department. These are ways to maintain both your external network with scientists outside your institution as well as strengthening your relationships with researchers you interact with every day. Now that you have more experience with networking, please “pay it forward” and mentor other scientists who could use your new found wisdom and advice. When scientists hear the word networking they often think about situations that they might encounter at conferences. There are concrete steps that you can take while at a conference that can maximize your chances of networking success. Several built-in networking opportunities exist within the schedules of conferences that make it easier to network. The major activities that occur at conferences are talks/presentations/symposia and poster sessions and these provide great venues in which to meet fellow scientists. If you are participating in a talk session, you have a built in excuse to introduce yourself to your fellow presenters and the session chair. When attending talks, think about good, solid questions that you could ask the speaker and go for it! Now the speaker will recognize you and so will everyone else who was in the audience of that session. If you are presenting a poster, get to know your physical neighbours during your poster session. If you are interested in a particular poster, engage the presenter in a conversation. Write down important suggestions, comments, questions, and feedback on your own work and the work of others. These will spark new ideas and lead to interesting conversations. Offer to share articles, information, and resources with others when these things naturally come up in conversation. Be open to possibilities for collaboration and picking up research tips and tricks from others. There are other “structured” events where you can network at conferences besides talk and poster sessions. Many conferences are organized by a scientific society. At annual meetings, the society will often hold business meetings. If you can see yourself becoming involved in the governance of the society in the future, then attending these meetings is a great start. Many graduate students that I know are not aware that they can attend business meetings, but if you are a member of the society your participation will be welcomed! Most conferences also offer an impressive array of workshops. These are excellent opportunities to network while getting involved in topics that interest you. I make it a point to attend professional skill development workshops and workshops targeted towards women in science and early career scientists when I attend conferences. Some conferences will offer social events for graduate students and post-doctoral fellows and if you are new to networking these events are less intimidating and offer you an opportunity to network with your peers. If you are interested in a career in industry you will want to talk to people in the exhibition hall who are representing equipment and chemical suppliers, publishing companies, etc. in order to build relationships in those areas. Be selective in the events that you attend in order to avoid burn-out. If you decide to go to an event I find it easier to go early to the event as it is less intimidating to network when fewer people are present. If you are attending a conference with people that you know, resist the urge to always huddle together. Try to circulate and mingle at events. Ask colleagues to introduce you to new people and return the favour by introducing them to people that you know. If you see someone standing alone, be inclusive and welcoming and ask them to join your discussion. Talk to people in the refreshment line during breaks. At meals you can be brave and sit with people you don’t know. Networking is a long term process. You don’t have to do all of the above at every conference that you attend. Decide ahead of time what you want to accomplish in terms of networking and do your best. In my next post I’ll talk about the importance of maintaining the relationships that you have started to build. What can you do after the conference is over to continue to strengthen your network? 1) Practice your 30 second and 2 minute research summaries. These are sometimes referred to as “elevator speeches”. If you only have 30 seconds to introduce yourself and your work what should you say? If the person that you are chatting with seems interested and engaged in what you are saying you will want to have some follow up points ready. 2) Practice your handshake. This advice may strike some people as outdated, but usually when I meet someone for the first time I shake their hand. You want to practice this skill so that you deliver a firm and confident handshake. Avoid the limp noodle handshake and the bone-crusher handshake at all costs. 3) Ask for advice from your mentors. Ask your research supervisor for advice. Has anyone else been to this conference before? What can you expect? Does anyone have any tips or suggestions for you? 4) Commit to doing a research presentation or a poster. Doing a talk gives you excellent visibility and serves as a natural ice-breaker if someone has seen your presentation at the conference. Doing a poster allows you to chat with new people that you might not otherwise meet. Put together the best talk or poster that you can and practice, practice, practice! Invite those people already in your network to come to your session or poster and return the favour. 5) Make prior arrangements to meet with Dr. Bigcog at the meeting. If you are interested in pursuing a Ph.D. with Dr. Bigcog then plan ahead to set-up a time to chat while at the conference. If this is not feasible, do you know anyone who will be attending the conference who can introduce you to Dr. Bigcog at the meeting? 6) Look at the conference program in advance and decide what you want to do and who you would like to interact with. Develop a networking plan before the conference. What amount of networking do you want to do in order for you to consider this conference a success for you personally and professionally? When will you need to take breaks to recharge your energy? 7) Apply for any awards that are available and that you qualify for. These include travel awards, presentation award, etc. Being an award candidate and winning an award can provide you with excellent exposure and aid in your networking efforts. 8) Be creative about your networking opportunities. Can you meet new people by sharing housing at the conference? Can you volunteer to help out with organization or registration? 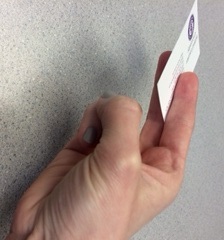 9) Prepare professional looking business cards. Having cards already made sends a professional message rather than having to scramble for a pen and paper to jot down your contact information. The next step is to put your plan into effect while attending the conference. Check back for my next blog post for how to maximize your potential to network while at a scientific meeting.